One of the best analogue mono synths on the market. Phenomenal sound and classic heritage. Reissue of classic analogue mono synth. Available with built-in MIDI-to-CV converter or patch panel. Classic Oberheim state-variable 2-pole filter. A version with both MIDI-to-CV and patch panel would be nice. On the optional patch panel, 33 inputs and outputs are available, turning the SEM into a semi-modular synth. The SEM is also available with a built-in MIDI-to-CV converter. Its heritage is undeniable; the SEM is an utter classic. Tom Oberheim is a living legend in the world of synthesis. The term is frequently misused, but we can't think of a better way to describe a man responsible for some of the greatest analogue synths ever made. The monophonic OB-1 and mighty polyphonic OB-X are rightly considered classic synths, while the DMX drum machine helped to define '80s Pop and Hip Hop. Out of production for over thirty years, the new SEM has been a long time coming. First announced in June last year, the synth finally arrives in the UK courtesy of German distributors Schneiders Buero. On the surface, the new SEM appears very similar to the original. Even the most eagle-eyed vintage fiends may take a while to spot the differences. Each oscillator now uses a large coarse tune pot and a smaller fine tune knob alongside rather than the fiddly dual concentric pots of the original. Over in the VCF section, there's a new slide switch to select band-pass mode rather than the original switched rotary pot. Internally, it's a similar story. 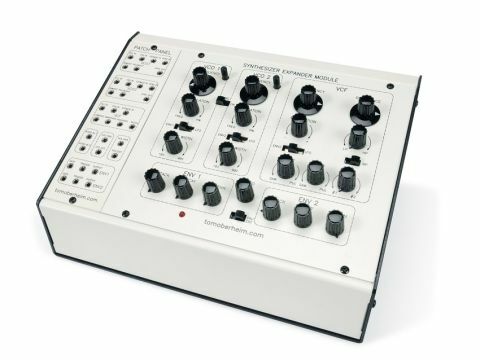 Oberheim claims that the circuit design is "almost identical", though a look inside reveals that modern surface-mount components are used rather than through-hole. Changes to the circuit have only been made where parts availability necessitated it or to add an extended range to a control (such as filter cutoff frequency) without affecting the sound. Even with these minor changes, it's clear that the new SEM is faithful to the original - somewhere between a reissue and a clone. It'll come as good news for owners of SEM-based Oberheim poly synths that the new version is fully interchangeable with the original in terms of size and wiring. The front panel appears wider, but the panel on the left-hand side of the unit is separate to the synth module itself. Our review model is equipped with a patch panel in this section, but there's also an optional MIDI-to-CV converter. The SEM is available in three versions. The bare panel (just the synth module - no case, no power supply) will mainly be of interest to owners of original multi-voice SEM-based synths. Our review model is equipped with the 33-point patch panel, but the SEM is also available with a built-in MIDI-to-CV converter. The standard audio output on the back panel of this version is supplemented by MIDI In and Thru, a gate output and two CV outputs from the MIDI converter, plus two audio ins. One of these inputs is routed through an internal preamp, absent from the patch panel version. The MIDI converter section contains a handful of options that make it well worth considering. In addition to the basics like channel selection, octave transposition and note trigger/priority modes, the converter also contains a handful of interesting CV routing options. Velocity, aftertouch or a MIDI CC setting can be routed to VCO frequency, filter cutoff or VCA level. It's not as flexible as the full patch panel, but it may be more convenient for some. However, we think the patch panel version has the edge as it's less hassle to buy a converter than to add patch points to a MIDI-equipped SEM. The topology of the SEM is easy to deduce from a quick glance at the front panel. Needless to say, this is proper, old school analogue we're dealing with. There are no LCD screens, rotary encoders or shift keys - all programming is done manually and if you're looking for patch storage or software editing via USB you're going to be sorely disappointed. Build quality is generally very good, although the pots are a little wobbly. Pots are centre-detented where appropriate (modulation controls and mixer section). At the heart of the synth are two voltage-controlled oscillators, each with sawtooth and pulse waveforms. Tuning stability doesn't seem to be a problem, with the VCOs requiring minimal adjustment after a short warm-up period. Two envelope generators are used to shape the signal and control modulation. ENV1 is routed to the output VCA and modulates VCO1 frequency or pulse width, while ENV2 is used to modulate VCO2 and the VCF. The envelope generators are Minimoog-style ADSD types, with attack, decay and sustain settings but no release. Instead, the release time of the envelope is also set by the decay knob - less flexible than ADSR but true to the original. The envelopes are unsurprisingly not the fastest in modern terms but more than fast enough for most purposes. The mixer section comprises three knobs to blend the four VCO waveforms and two external inputs, while the LFO generates a sine wave up to audio rate. The filter section is the real star of the show. Tom Oberheim deliberately chose to use a 2-pole filter (12dB/ octave slope) in order to set the SEM apart from the more common 4-pole (24dB/octave) filters of the era and give Oberheim synths a unique sound. The SEM's multi-mode VCF, designed by ARP engineer Dennis Colin, features an unusual state-variable arrangement. Turn the pot fully anti-clockwise for a low-pass filter and fully clockwise for high-pass, but anywhere in between offers a notch mode, with the relative balance of low and high frequencies infinitely adjustable. It might be hard to imagine exactly how the filter shape changes, but an incredible variety of unique sounds can be achieved by sweeping from one end of the range to the other. All-in-all, the sound is remarkably similar to the original SEMs and won't disappoint anyone hoping for huge, powerful analogue tone. For us, the most exciting feature of the new SEM is its 33-point mini-jack patch section. Every imaginable patching option is available via its own dedicated socket on the front panel, allowing modulation and signal routing to be customised in hundreds of ways. The patch panel is fully passive so there are no additional CV mixers or processors on board but the patching options seriously open up the potential of the hardware, creating a semi-modular synth in the vein of the Korg MS-20 or ARP 2600. This makes the synth incredibly flexible, offering routing options which aren't available as standard. Even if it's something as simple as routing ENV2 to VCO1's external modulation input, it means that the new SEM can achieve sounds that would only have been possible on a heavily modified original. It also means that the SEM becomes a great option for modular synth owners. Even if you only added a couple of different VCFs you'd have a huge sonic palette to play with. The good news for buyers of the MIDI-equipped version is that all 33 of the patch points are clearly marked on the circuit board and easily accessible via connectors. The SEM is intended to be easy to modify and it would be no problem for a tech to add sockets for some or all of the CV inputs and outputs. The SEM isn't meant to be an updated or revamped version. Essentially, it's a faithful reissue of the original save for a couple of minor modifications to replace obsolete components. As such, it's hard to criticise the design of a synth which has already been around for nearly four decades and is rightly considered an all-time classic. Even if we were forced to design a 2010 update there's very little we'd change: a bit more space around the tuning pots, more wave shapes and an LED indicator on the LFO, maybe a headphone output? Even so, suggesting potential upgrades is slightly churlish given the nature of the SEM. Complaining about the lack of modern features on an early '70s synth is like buying a classic car and being disappointed it doesn't have sat nav. Comparisons with modern synths miss the point of the SEM. It might be less flexible than a Mopho and more expensive than a Tetra, but it easily matches them for sheer balls and its heritage is undeniable. You're not just buying an incredible synth, you're buying a classic. Whether you go for the patch panel or the MIDI converter you won't be disappointed, but we'd love to see another option added to the line-up. Call us greedy but an SEM with both MIDI and a patch panel would be the clear winner. There's plenty of space inside of the box for them both to slot in and it'd make for a hell of a semi-modular MIDI-equipped mono synth. Tom told us that he's considering the possibility of building just such a unit, so with a bit of luck the ultimate SEM might just make it into production. Watch this space.